Extract a single slide from a deck: How often has this happened to you? You’re working on a deck along with someone else. They own the master. You need to make a change to one slide. The only way to get them that one slide is to delete all the slides but this one, save it off as another file, and then email it to them. Why can’t I just extract that one slide and send it directly? Much less risky (since I don’t delete all slides and save), and much faster. Layers and object locking: I do a lot of complex graphics, and try to avoid using another app (OmniGraffle is the usual fallback) just because last minute changes then involve more steps/time. 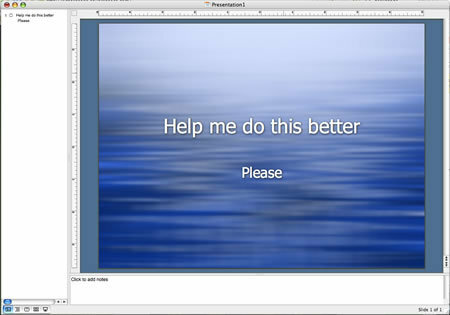 (Yes, I’m perfectly aware of PowerPoint’s shortcomings in how its graphics look…). It’s time for PowerPoint to introduce layers and object locking so that complex graphics stop becoming such a hair-pulling exercise. Improved zoom: The zoom capability on PowerPoint is a joke for a graphics program. You should be able to zoom in on specific points and do box-zooms. The current scheme is just too time-consuming. Add a real pan function while you’re at it. Thumbnail view while presenting: If I need to switch to a page quickly I have to go through a multilayer menu that provides little information about which slide is which. A thumbnail/light-table view would be far superior. Tools for non-linear presenting: How often have you wanted to skip to another piece of a deck to follow a tangent thought, or have side-topics available that may or may not come up? The thumbnail view is one approach for this, but other navigation tools would be helpful too. Keyboard shortcuts for back/forth like in a browser, for example, or ability to set bookmarks, or to bring up a dynamic filmstrip of slides. These days most of the client presentations I do are discussion-oriented, I don’t want them to be lectures. Discussions are fluid whereas lectures are (stereotypically) linear, and unfortunately PowerPoint and Keynote follow the latter pattern. Keynote was designed, after all, for Steve’s super-scripted and utterly linear keynotes. Suppress email and IM and calendar notifications: Why can’t one Microsoft product (PowerPoint) take control over others by not letting pop-up notifications get on top of your presentation? Sensitive/confidential information often appears in these, and it’s easy to forget to turn one off. Cover desktop: On a similar note, the presentation app should cover my desktop when mirroring displays. I use the nifty utility DeskShade for the same effect, but it would be great to have it integrated. Text touch-up while presenting: I’ve lost count of the number of times I’ve had to make small changes to text on a slide as part of a client discussion - why should I have to dump back out to the unattractive and jarring creation mode with all its menus and palettes? Better text display: Long the bette-noire of graphic designers (and I hear no end of guff about it from graphic designers at frog), PowerPoint is pure and simple terrible at displaying text in a properly kerned way. Many people, probably most, don’t notice it I suppose, but it still gets under my skin. If Microsoft were to really look hard at how PowerPoint is used and address the significant workflow issues, it would be a far more usable and pleasant tool. For that matter, it would be great if Apple did the same with Keynote, which is actually disappointing in that it mainly addressed cosmetic issues of presentation visuals rather than taking the usually thorough Apple approach to user needs.